← How is the mind different to the brain? 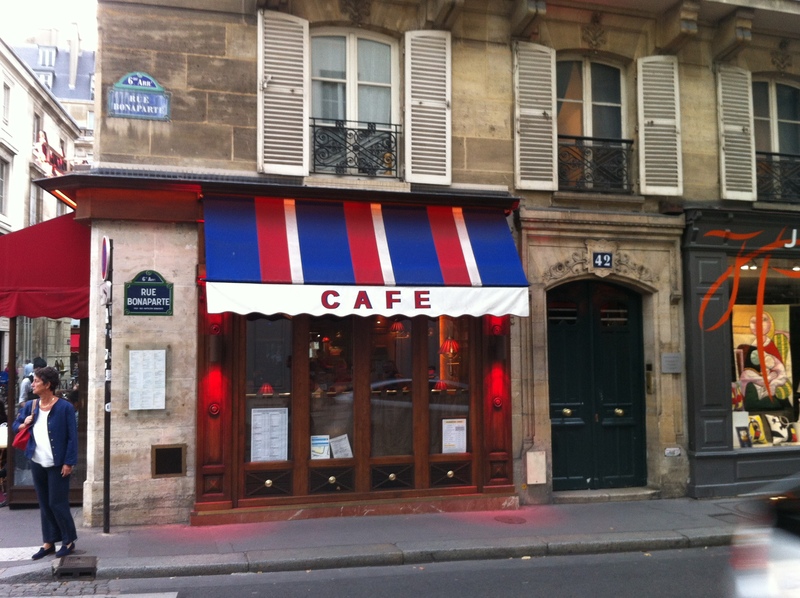 It’s a warm early autumn evening in Paris and I’m standing across the street from Jean-Paul Sartre’s old apartment at 42 Rue Bonaparte in St-Germain-des-Pres. The sun is still out, although the shadows cast by the cafes, boutiques and galleries that grace this still-bohemian yet chic inner-city street are starting to lengthen. Scooters, motor bikes and cars bustle up and down the street, competing with local shoppers, promenading lovers, bookshop browsers and families in their Sunday best emerging from a late afternoon tea at the street’s famed specialty macaron patisseries. The footpath here is only two-and-half feet wide, so although it’s not too crowded, pedestrians regularly spill out on to the cobble-stoned street. As I look up at the shuttered second-floor balcony of the legendary philosopher’s home, I recall from my reading that Sartre moved in here when he was forty-one years old to live with his mother, following the death of her second husband Joseph Mancy. Sartre had resented Mancy ever since he had inconsiderately displaced Sartre at the age of twelve from his position as sole object of his mother’s attention. As a child, the sensitive and lonely philosopher-to-be had no friends his own age, and had been inseparable from his mother ever since the death of his father when he was an infant. When the opportunity presented itself for the forty-one-year-old to be reunited with his much-missed mother in her perfectly located apartment overlooking one of the Left Bank’s most charming and cosmopolitan streets, he couldn’t resist. The pair were joined by Eugénie, the mother’s longstanding faithful family maid, who insisted on referring to the now-famous adult Jean-Paul as she always had — by his childhood pet name of ‘Master Poulou’. There is no sign or plaque today to mark the apartment’s previous esteemed resident. From my vantage position across the street, I scan the philosopher’s old residence, and can just make out what appears to be an art-deco table lamp, its light diffusing through a muslin curtain that flaps at the apartment’s full-length window in the warm evening breeze. I strain to see through the veil of shifting drapes, but other features of the apartment’s interior elude my gaze. At this point my imagination takes over, and I see the thick-spectacled writer, pipe in mouth, at his desk at the window looking out on to the jostling bohemian postwar Paris streetscape below, as he would have done in the 1940s and 50s when he lived here. Black-and-white photos I have seen of Sartre at work in his rue Bonaparte address come flooding back to me, in which he sits surrounded by untidily crammed bookshelves at a desk covered with paper, pencils, and an overflowing ashtray. According to those who knew him back then, the prodigious writer didn’t have the healthiest of lifestyles during these years. He didn’t like fruit or vegetables, maintaining his furious writing schedule on a diet that consisted almost entirely of sausage, cigarettes and up to fifty pills a day of the amphetamine Corydrane. Like many successful writers, Sartre had a daily ritual, though his was unusual even by the standards of his fellow bohemian intellectuals and artistes. The first thing this Don Juan of philosophy would do every morning was to make it clear to whomever he had seduced the night before that she should now leave so that he could get on with his writing. After a coffee and morning cigarette, he would then set to work at his desk for several hours before breaking for lunch with his beloved companion and fellow-philosopher Simone de Beauvoir at the nearby Café de Flore or the Café Deux Magots. During lunch Sartre would discuss the progress of his morning’s writing with Beauvoir, but he would also invariably relate to her details of his most recent sexual conquest. Sartre had managed to convince the initially reluctant Beauvoir years earlier that, in keeping with the principles of freedom inherent in their existentialist philosophy, they should not only have an open relationship in which each was free to take on other lovers, but that they also had a duty to document their experiment in freedom and to disclose everything about these intimate encounters to each other. Remarkably, the two philosophers stayed faithful to this arrangement for the entire fifty years they were together. After lunch Sartre would return to his apartment and Beauvoir to her hotel (the couple never lived together at any stage during their long, successful and highly unconventional relationship) and resume working through to the early evening. It is now about 7pm and I’m not sure how long I’ve been standing here on rue Bonaparte caught up in my imaginings about Sartre’s life, but I notice the sun is starting to set. At this time of day sixty years ago, Sartre would have finished work and begun getting dressed to go out for an evening aperitif at one of his favourite local bars with Beauvoir and a few of their friends. They had an illustrious list of associates at the time, including fellow existentialist writer Albert Camus, avant-garde poet Guillaume Apollinaire, and even, for a short period, Pablo Picasso. I turn around to take in the surrounding view, and notice that directly across the street from Sartre’s old apartment is a bookstore. 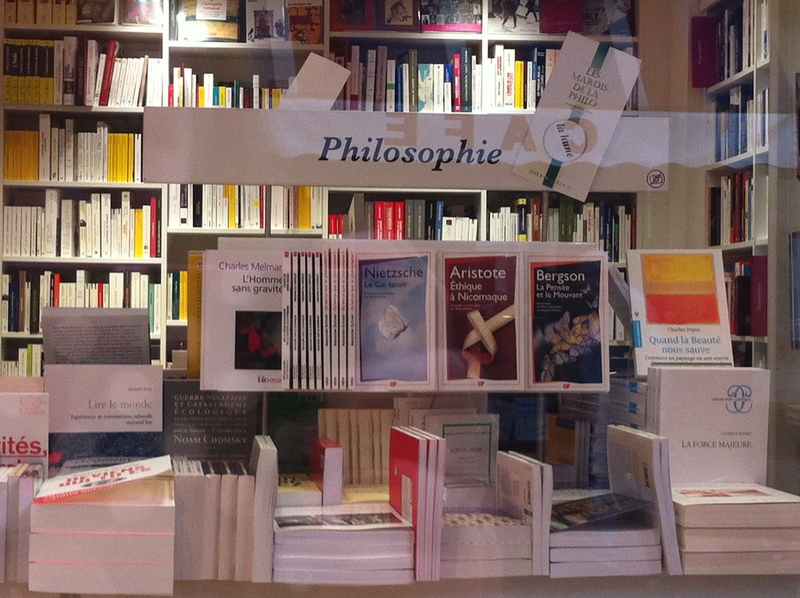 A large sign in the store window says Philosophie, underneath which is an impressive list of titles on Europe’s finest thinkers. I find the entrance to the store in a side-street around the corner and go inside, where I am greeted with row after row of works by and about Sartre, Freud, Nietzsche, Marx, Levi -Strauss, Deleuze, Derrida, Hegel, Foucault and many others. The bookshop is full of other people browsing, who, as far as I can make out, are all French. I feel heartened to see such an interest in ideas and philosophy in this part of Paris so many years later. I notice all the titles are in French. I ask the bookstore attendant, a rather gaunt but handsome young man with slicked-back dark hair, ‘avez-vous libres en anglais?’ He replies ‘non, seulement français’. They have nothing in English, only French. I purchase a slim volume about Kant as a souvenir, and as I leave the store, determine to myself that I will make a concerted effort to learn more French so I can read this and other books published in a country that clearly values ideas and literature much more than my own. 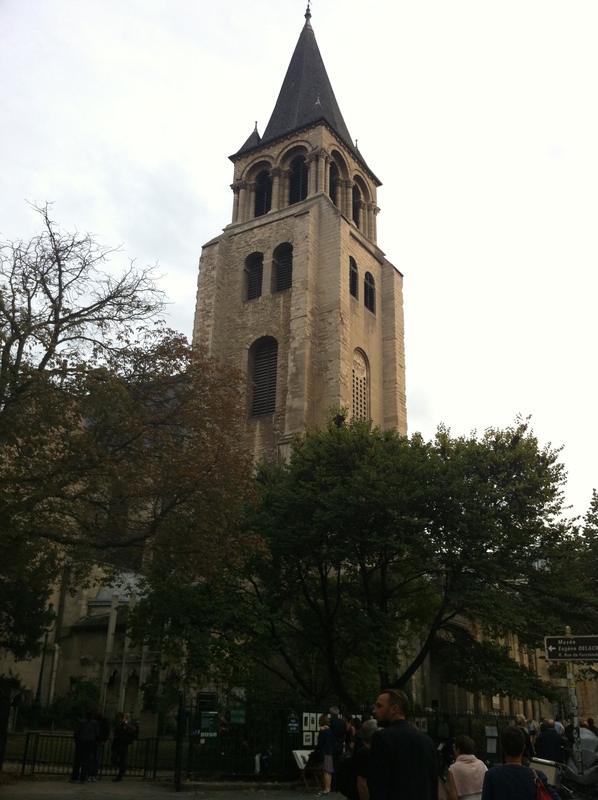 As I come out of the bookstore on to the side street, I encounter the beautiful St-Germain church, into which are streaming hundreds of worshippers for the evening mass. I follow them inside to be assailed by the sweet pungent scent of incense, and a church packed full of locals singing a hymn in full voice. To my right are candles lit to the memory of the departed. At the front of the church, beyond the jostling crowd of the faithful, are a flurry of priests in white performing the mass’s rituals. As I gaze around, intoxicated by the soaring voices, I take in the exquisitely beautiful stained glass windows and gothic statuettes leaning from the church’s interior walls and marble pillars. After another hymn I leave and enter a small garden on the church’s grounds. A couple of people, each on their own, sit on bench seats absorbed in books they are reading. In the centre of the garden is a bust of the aforementioned poet Apollinaire. It is only later, on consulting my guidebook back in my hotel room, I read that this sculpture was done by his friend Picasso, and originally erected a block away in the Café di Flore, the favourite haunt of not only Apollinaire, but also his close friends Jean-Paul Sartre and Simone de Beauvoir. I am also reminded that in St-Germain, Paris’s oldest church, lie the remains of the father of modern philosophy, Rene Descartes. The sun has now almost completely set as I sit on one of the park benches in this beautiful garden with my fourteen-year-old daughter Alexandra, who is accompanying me on this pilgrimage of the French philosophers. And although this is only the first day of her first ever visit to Paris, I can already tell from the look in her eye it won’t be the last.